She was a writer of romance and a gentle singer of Celtic music; he was a rock star. He had lived for years in the seamy world of L.A. rock and roll; she had grown up in the shelter of the mountains of Idaho. She was young and lovely; he still turned heads with his long hair and good looks even though he was old enough to be her father. Thrown together on a concert tour, the attraction between them was impossible to ignore as they both remembered an encounter two years earlier—when she had been in over her head and he had rescued her from a harrowing situation—and neither of them had been able to forget it. Slowly he reached out to her again, and slowly she learned to trust, until she found herself Loving Andy. But even though love can be profound, obstacles can be also. And sometimes, they can seem insurmountable. Sometimes choices must be made, and sometimes…love is not enough. But when love is real, when the heart is steadfast, can love overcome in the end? As one person put it who sent me a card when she had finished reading Loving Andy, this book is a nice, happy love story. Sure, there are some problems, some moments that will make you gasp a little and feel a wonderful heartache for those concerned. 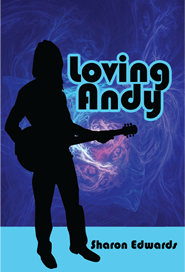 But for all intents and purposes, Loving Andy is indeed a happy love story. When I handed the manuscript to a friend who keeps my confidences and thus earns the right to read my stories first, I told her that I wanted my stories to be known for their happy endings. And this book definitely delivers that. But the first question I was asked to answer at my first book club meeting was, “Why did you decide to write this book?” That’s an intelligent question, don’t you think? But it was certainly one I wasn’t prepared to answer, so I stumbled about, giving the best reason I could come up with on the spur of the moment like that. And I don’t even remember what that was. So in the interim, I’ve thought long and hard about that question, realizing that my readers deserve a better, more thoughtful answer, because I certainly took a better, more thoughtful approach to writing the book. I will admit that my first desire was simply to write a compelling love story, one that would touch the reader’s heart and make her long for more. But why did it take the form it did? Why a May-December romance? There were many influences that came to bear on that decision—particularly, was an admitted life-long fascination with this idea of an older man and a younger woman. Certainly, my father told me enough times as I was growing up, “that could never happen!” But I was never so sure about that. Second, a rock group I have long admired suddenly seemed to “come upon the stage again” at that moment in my life—at least to me. I was mesmerized by their professionalism and their longevity. I was mesmerized by who they were. And I was simply filled with a great admiration for all they had accomplished in their long career. It was so easy for me to develop a hero from such a group of men, although I would never pretend to be writing about a particular rock star at all. Andy is simply the result of some imagining of a wonderful man on my part! And Marian—how did she come to be? For her, I looked into my own heart, at the longings I possess at this time in my life, and I developed a young woman who comes from some beautiful places where I’ve spent time, who has some wonderful adventures I would love to have had, and who would have been influenced by a life I know personally—or in some cases, wish I could know! What I discovered was that the formula for this love story wasn’t necessarily an older man and a younger woman at all. The formula was, as it always is, the right two people. In this case it’s a man who’s longed all his life for something better, something stronger than the empty pleasures offered him by fame and fortune. And he finds it in this lovely young woman from Idaho who’s always longed for someone just like him. If you haven’t read Loving Andy, I hope you will—especially, if you plan to read the sequel, Coming Down to Earth. And when you do, I hope you’ll take this story to heart. I hope also that you’ll get back to me, that you’ll tell me what you think. Your reaction is as important to me, if not more important, than making certain my manuscript has every I dotted and every T crossed. For it is your thoughts that make it all worthwhile.